When designing a gamified system, which is essentially a system for motivating users to continue using your software or process, one good model to use is the Self Determination Theory. 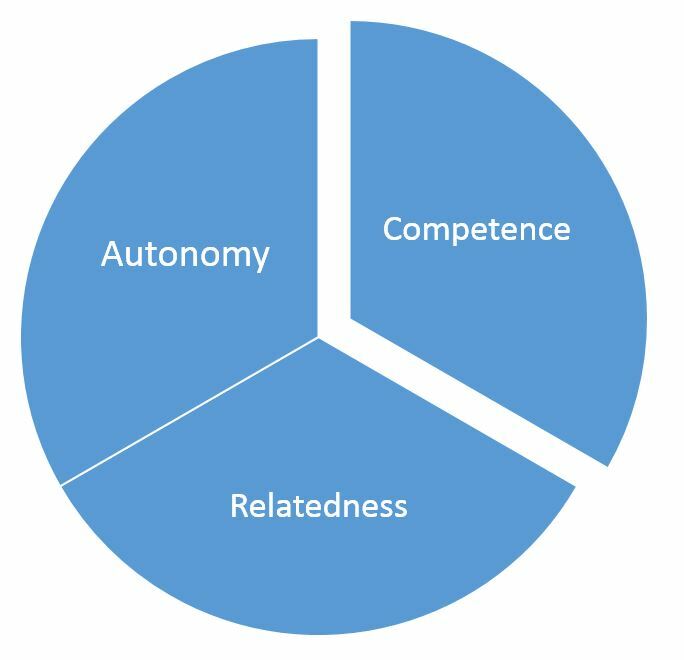 This theory states that there are three primary intrinsic human motivations that we need to tap into. By intrinsic, we mean that the activities that meet these needs are a reward in themselves – they don’t need extrinsic (external) rewards like achievements or points. In fact, adding extrinsic rewards to such intrinsic motivators may have the effect of lessening their appeal. Intrinsic motivation is always superior to extrinsic, and we need to ensure that we are addressing the three emotional needs for autonomy, competence, and relatedness. How have I built choice and autonomy into my system? What skills are my users gaining? How am I confirming those skills? Is my difficulty increasing at the right rate? Too slowly or too quickly? What would I want to share about this journey? How would I share it? Is there a role for cooperation and teamwork, or player vs. player interaction? If there are leaderboards, is there a global one, and/or more localized cohort groups? How do we define a cohort? Intrinsic motivation is what makes a game or software or process fun all by itself – people want to do it because it meets human needs. And THAT is the idea behind gamification.